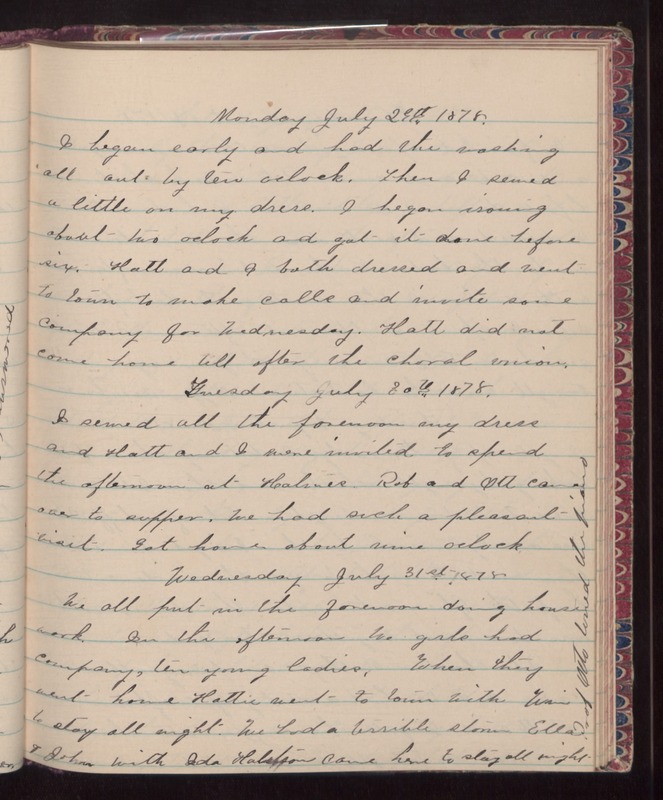 Monday July 29th 1878 I began early and had the washing all out by ten oclock. Then I sewed a little on my dress. I began ironing about two oclock and got it done before six. Hatt and I both dressed and went to town to make calls and invite some company for Wednesday. Hatt did not come home till after the choral union. Tuesday July 30th 1878 I sewed all the forenoon my dress and Hatt and I were invited to spend the afternoon at [Halrues?]. Rob and Ott came over to supper. We had such a pleasant visit. Got home about nine oclock. Wednesday July 31st 1878 We all put in the forenoon doing house work. In the afternoon we girls had company, ten young ladies. When they went home Hattie went to town with Win to stay all night. We had a terrible storm. Ella & John with Ida [Halston?] came here to stay all night. [Prof?] Otto loved the [illegible].